6. 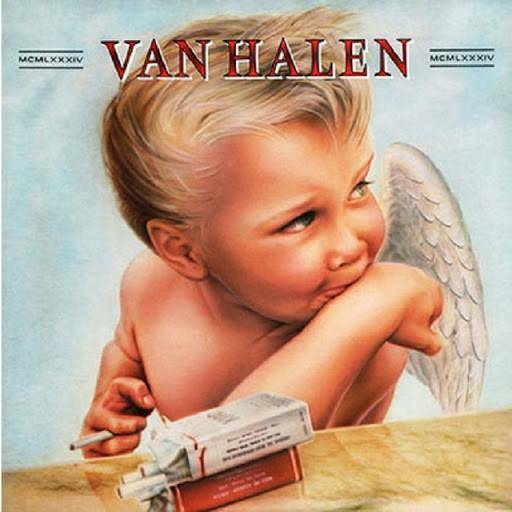 The cover of the 1984 album features a smoking cherub. It was censored when released in the UK. A sticker was placed to cover the cigarette in the cherub’s hand and the packs of cigarettes visible on the album cover. 7. In the original release of the album, all song credits were given to Edward Van Halen, Alex Van Halen, David Lee Roth, and Michael Anthony. In the UK single for “I’ll Wait” Michael McDonald was credited as a cowriter, but he was not given the same recognition in the US version. 9. The song “Jump” has the Eddie Van Halen guitar solo, which he clauims is his favorite solo not written by him. That classic solo was made when the song producer spliced two different versions to create the finished product heard in the song. 10. David Lee Roth can be heard yelling in the video for “Jump.” He did that so he could get his real voice onto the music video.